Teaching methods that are often recommended to improve the learning environment in college science courses include cooperative learning, adding inquiry-based activities to traditional lectures, and engaging students in projects or investigations. Two questions often surround these efforts: 1) can these methods be used in large classes; and 2) how do we know that they are increasing student learning? At the University of Massachusetts, we have transformed the environment of a large-enrollment oceanography course (600 students) by modifying lectures to include cooperative learing via interactive in-class exercises and directed discussion. Assessments were redesigned as "two-stage" exams with a significant collaborative component. Results of student surveys, course evaluations, and exam performance demonstrate that learning of the subject under these conditions has improved. Student achievement shows measurable and statisticdally significant increases in information recall, analytical skills, and quantitative reasoning. There is evidence from both student surveys and student interview comments that for the majority of students, the course increased their interest in science--a difficult effect to achieve with this population. An interactive game used in conjunction with traditional laboratory work, group discussions, student presentations, and writing exercises, provides an enjoyable and motivating dimension to a university seminar/lab course in Historical Geology and Paleontology. A simple spelling-bee-type game evolves over ten weeks into a room-sized board game based on the geological time scale. The game helps students learn fossil morphology, identification, classification, and paleoecology while illustrating the occurrences of important fossil groups, sea level fluctuations, and orogenic events through time. It also serves as an effective means for evaluating student progress in the laboratory. 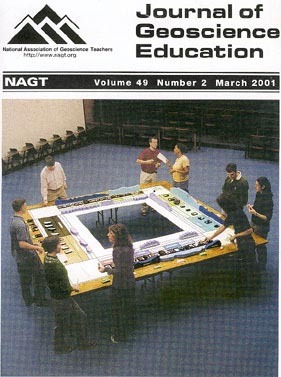 Although the game content is designed for geology majors in a university setting, the time scale game board can easily be adapted to a secondary school environment. Accreditation may be coming to the geology discipline. Views of 142 Department Chairpersons/heads are divided, with 43 welcoming, 61 neutral or uncertain, and 38 opposing disciplinary accreditation. Only 24 respondents would welcome the establishment of standards by a committee largely external to academe, whereas 51 are neutral and 65 oppose. However, if accreditation were in place, 74 would probably seek it, 57 would consider it, and only 11 would not. Thirty-eight respondents anticipated no effect on the department, if they were denied or chose not to seek it. With regard to their choice of accreditation model, 62 preferred the American Chemical Society model, 42 th Accreditation Board for Engineering and Technology model, 28 expressed no preference, and 10 chose not to answer. Detrended correspondence analysis indicates that attitudes toward accreditation are not related to department size, yet there are patterns in the answers of a given respondent. Chi square tests for heterogeneity or independence indicate that those opposing accreditation for his/her department tend to oppose having curricular standards by a committee largely external to academe. The same respondents also tend to think that not seeking or obtaining potential accreditation would have no negative ramifications on the department. Most departments would not currently welcome accreditation. Those persons currently neutral or uncertain about disciplinary accreditation need to learn more about it and take a firm position. Detailed information on ABET and ACS accreditation are available from their websites. I have developed an effective exercise for a lecture class which breaks the monotony of note taking and requires active student thought and participation. The exercise is effective in helping students grasp the immensity of geologic time as it relates to the erosion of a prominent local landmark, Massanutten Mountain. The four parts of the exercise require the students to: 1) formulate a conceptual analogy to estimate the length of time required to erode a mountain; 2) use a computer program to calculate the volume of the mountain; 3) mathematically calculate the time required to erode a volume of rock equalivent to the mountain; and, 4) identify the most likely source of error in the procedure. Copies of the exercise and data file are available from the author either as email attachments or on a floppy disc. An ongoing challenge in curriculum development for modern, process-oriented courses in mineralogy and petrology is to design exercises that promote understanding of the mechanisms and rates of fundamental mineral processes. We have developed an exercise wherein students determine magma ascent rates for recent eruptions of Mount St. Helens. The ascent rates are determined from analysis of the thickness of amphibole breakdown rims and comparison to experimental calibration of the reaction kinetics. As an extension activity, the results are incorporated into a discussion of volcanic hazards planning for the Cascades Range, Pacific Northwest, United States. This exercise requires no special equipment and is easily adapted to introductory courses in earth and environmental sciences without compromising the overall learning objectives. The educational role of state geological surveys is increasing, yet state funding for this role is commonly lacking. Staff members of the Geological Survey of Alabama/State Oil and Gas Board of Alabama have developed and implemented a successful Outside Funding Model to support educational outreach programs. Staff members formed an informal organization within the agency and raised money specifically for educational outreach. The primary vehicles for fund raising are an annual charity golf tournament, sales of t-shirts and field-trip guidebooks, and small grants awarded by a variety of organizations. The money raised is used to fund a wide variety of educational activities that would not be possible otherwise. The Alabama Outside Funding Model could be duplicated by surveys or similar agencies in other states. An interactive, internet exercise enabled students to engage in cooperative library and web research on a controversial topic in science (and ethics), specifically the cloning of extinct forms of life. To debate the many complex issues embedded in this topic, students had to apply knowledge acquired from course readings, lectures, and in-class discussions about dinosaurs, their evolutionary history, diversity, distribution, physiology, behavior, environmental requirements, and extinction. They also had to achieve a general understanding of the techniques used to discover and retrieve ancient DNA and to produce a clone from a living adult animal. During an in-class "trial," two teams of students representing six types of specialists argued cases for and against dinosaur cloning. Student "judges" heard testimony, posed questions to the specialists, and rendered their verdict about whether dinosaur cloning should be allowed. Working cooperatively in small groups and arguing a position in an authoritative fashion required students to exercise their communication (written and oral), collaboration, and critical thinking skills. This exercise also created a dynamic learning environment in a moderately large introductory geology course and demonstrated the importance of scientific literacy in the contemporary experience. In order to promote scientific literacy among science and non-science majors, students need to learn science process skills and focused interdisciplinary skills in addition to the traditional course content. Web sites that publish extensive geoscience data sets can be tapped to develop active inquiry exercises that mimic some of the tasks and thought processes scientists perform everyday. One such activity uses NOAA's Live Access to Climate Data site to teach introductory oceanography students about temperature and salinity variations and basic surface water circulation. Another uses NOAA's EPIC Data Selection data base to teach upper-level students about vertical and horizontal distributions of heat, salts, and nutrients, as well as thermohaline circulation. Both exercises stress the interactions between the ocean and atmosphere on different spatial and temporal scales, plus the flow of energy and matter between these subsystems of the earth. The power of these exercises is that they convey more than basic course content skills. They are also designed to teach the students science process skills such as observing geologic data, inferring outcomes based on data, interpreting the data to reach conclusions, predicting additional results based on observed patterns, communicating ideas and results to others, and formulating hypotheses to explain patterns and anomalies. As such, these exercises help teach students to think like scientists. Any instructor, with some extra effort and preparation, can accommodate a student with visual impairment in an introductory physical geology course. Advance planning, frequent communication between the student and the instructor, assistance from the institution's Office of Disabled Student Services, modified laboratory exercises, and innovative props created for a physical geology course can assist in making the experience positive not only for the student with visual impairment, but also for other students enrolled in the course. Steps that were necessary for successful completion of this course included meeting the student with visual impairment and making arrangements to provide all the handouts and syllabi for the course prior to the commencement of the class, detailed planning of all lectures, class activities, and laboratory exercises, and mechanisms for providing feedback for the instructor and student throughout the duration of the course. Described herein is a simple computer model that enables undergraduate students to learn some interesting and fundamental lessons about the dynamics of Earth's climate system. This model uses the program STELLA to treat the climate system as just two boxes (reservoirs) that represent the thermal energy stored in the atmosphere and the Earth's surface (a combination of land and water). These reservoirs are linked by a small number of flows that transfer energy from one reservoir to another as well as to and from outer space. The simple nature of this model means that it cannot provide information about the spatial variations in temperature. The model developed here incorporates real values for the components of the system and thus yields values for the components of the system and thus yields reasonable estimates for the temperature of the Earth's surface and atmosphere under a range of conditions. The model can be used to study the response of the climate system to a wide variety of changes such as increasing or decreasing the efficiency of the greenhouse effect. The power of this kind of modeling exercise as a learning tool lies in the fact that it is experiential in nature and enables students to ask "what if" questions and then find the answers to their questions through experimentation. Inexpensive rock permeameters made from overhead transparency sheets and flexible tubing were built in an introductory hydrogeology course. They operate in a falling-head mode - water drains down a tube connected to the base of a plastic rock chamber. A hydraulic conductivity value of 3.2 x 10-5 cm/s was calculated for a four-sided sandstone specimen from the Woodbine Formation. Similar values were obtained in a second test on the same specimen, a third test on a six-sided specimen, and a fourth test using a conventional falling head permeameter. Students preferred building creased-plastic permeameters and calculating hydraulic conductivity values rather than being given a hydraulic conductivity value in a problem statement. Creased-plastic permeameters cannot withstand air vacuums (which are sometimes used while saturating a sample with water) and may leak if poorly constructed or used with nearly impervious rocks. For these reasons, creased-plastic permeameters are not suited to research. However, they provide an inexpensive way for students to estimate the hydraulic conductivity of local rock aquifers.